Hackbright Goes To Autodesk’s Pier 9 Workshop! The Hackbright Summer 2015 engineering fellows toured the Autodesk office at Pier 9 Workshop this week! Special thanks to Colin Brauns in Autodesk talent for helping us organize tour guides for the workshop – Erin Bradner, Senior Principal Research Scientist in the office of the CTO, and Peggy Snyder, Director of the Global Education initiative (pictured, below, leading a tour). After the tours of Pier 9 Workshop, the Hackbright fellows headed to Autodesk Gallery for lunch and talks from Autodesk engineers Shiya Luo and Nop Jiarathanakul. Shiya is on the Autodesk Developer Network team, and Nop is on the Visualization team where the engineers build interactive models of full mechanical designs that users can interact with in a web browser. Nop shared his background in arts and graphics, and his inspiration for getting into web development – he loved the DeviantArt website. He emphasized the need to build a list of projects to put on your resume, and hinted that anxiety around the technical interview process led him to keep working at building more websites and building up his portfolio of work. “Put out more samples and stuff. You keep trying, and you will got another job…” said Nop. His current role at Autodesk was not his first job out of college, as he has been through several jobs and many projects/websites before becoming the polished Autodesk software engineer that he is today. 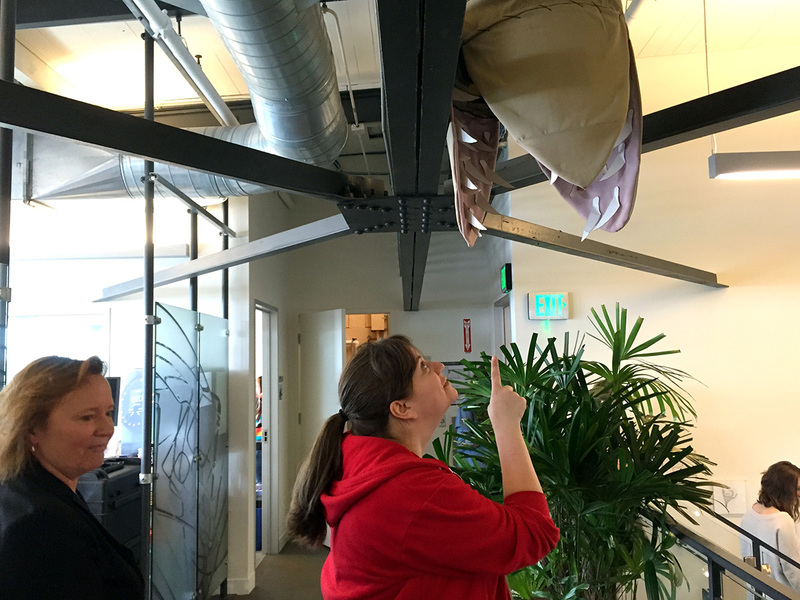 Hackbright team member Heather Bryant spots a sandworm in Pier 9!